Yes, it really is National Popcorn Day! Honey Popcorn Balls [image source: fischfood-com] All Hallows Eve is upon us. Time to make popcorn balls! In a large sauce pan, combine honey, sugar, salt and butter. Over medium heat, stirring frequently, bring the honey mixture to 275oF. Pour honey mixture evenly over popcorn and stir to coat with a wooden spoon or rubber spatula then set aside to cool enough to handle but still be pliable. 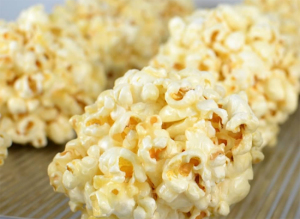 Butter your hands and shape popcorn into 6 balls. Let them completely cool then eat. Eat lots and lots of them!